Lampe road gave us the opportunities to showcase some unique construction materials and design choices. The Owners of the Lampe Road property sought to open up their existing floor plan and incorporate features like a folding glass curtain wall, backlit kitchen island, and full-width fireplace. We began by remodeling the entryway – framing out the opening, installing a new door and updating finishes. In the great room, we raised the floor and removes all of the walls. This opened up the floor plan and created a much more relaxed and open atmosphere. Installing the full-width fireplace added some warmth and interest to the room as well. In the dining room, we revamped and relocated some design elements, updated finishes and installed a bar fit for entertaining and hosting guests. Having the capability to entertain guests was one of our client’s immediate needs. 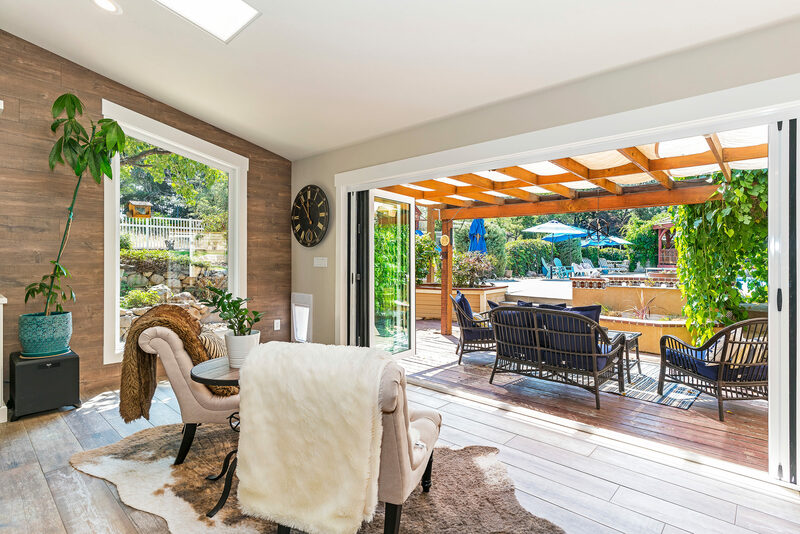 We were happy to provide design solutions like an open floor plan and glass curtain wall that opens up to the backyard pool.